An analysis of notational systems and their relationship with electroacoustic music and the function of the score for a performer, analyst and composer. 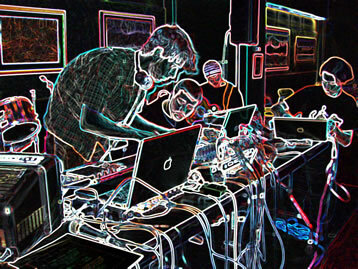 References to acousmatic music, sound diffusion, electronic resources with live performers, computer-assisted performance and the UPIC system. 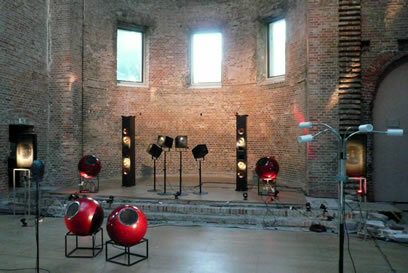 In 2007, a network music performance (NMP) study was carried out at the Sonic Arts Research Centre (Belfast). A variety of network scenarios were tested in an attempt to simulate conditions that occur in geographically displaced network performances. An historical overview of computer-based live electronics traced through the development of vocal compositions reflective of this genre. Klein then looks at important Canadian and international contributers (composers and performers) to live and interactive electronic vocal music. Via Agostino Di Scipo and John Bowers, the author discusses performance ecosystems and technology-as-practice as a way of exploring value in electroacoustic music. 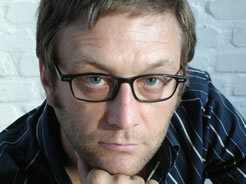 The author discusses the potential of the computer to assist in the creation of realtime composition, which he distinguishes from improvisation, and posits his software “Kinetic Engine” as one model for intelligent realtime composition. The author invited members of the listserv cec-conference to contribute their own definitions of the term “interactivity”. A summary of the comments and criticisms about the term. Interactive situations have different degrees of structural openness and playfulness, “ludicity”. What are the conceptual limits of notions such as instrument, computer and machine? The article adopts a phenomenological perspective and discusses a definition of interactivity through recent works. A look at the context of digital instruments as instruments for improvisation. The authors summarize and analyse of the results of a survey comparing acoustic and digital instruments from a phenomenological perspective. A new electronic instrument developed by and for composer-singer-performer Alex Nowitz that extends vocal art performances increasing the array of vocal possibilities towards the creation of abstract reflections of voice sounds produced in the live situation. Philosophies and strategies pertaining to the instruction of free musical improvisation are presented. “Endphase isn’t merely improvisation, but rather something between composition, improvisation and performance.” A report on the origins, work and æsthetical choices of this laptop improvisation trio, and a discussion of how their background as composers influences their performances. 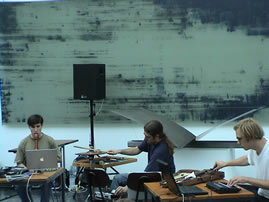 City Composers’ Collective (Pasoulas et al) performing Improvisation 09.07.08. Julieanne Klein performing David Adamcyk’s Avant la larme. Julieanne Klein performing Mauro Lanza’s Erba nera che cresi segno nero tu vivi. Julieanne Klein performing Philippe Manoury’s En écho. Julieanne Klein performing Emily Hall and Nik Kambeitz’s Agauë: A Musical Drama. Several excerpts of Endphase performing. Alex Nowitz performing his Studies for Self-Portrait. Alex Nowitz performing his Music for a Singer/Performer with Live Electronics, Gestural Controllers and Playback for Ten Loudspeakers.